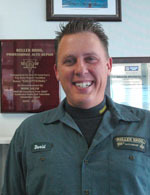 David Rogers, the Monday Morning Mechanic, shows some great ways to keep your car clean and keep its value up. Cheap Brake Jobs Are NOT Worth It! Why CHEAP brake jobs are NEVER worth it! Change your timing belt EARLY and save BIG BUCKS! Changing your timing belt early can save you thousands! You can't save money by NOT performing car maintenance!